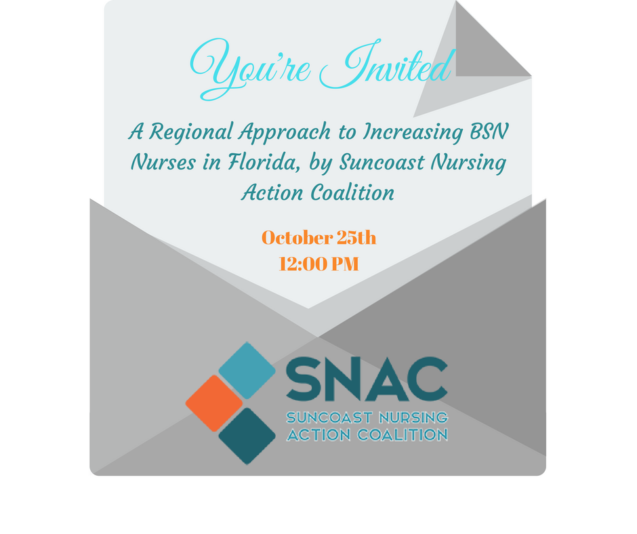 In this free webinar, the Suncoast Nursing Action Coalition will share a collaborative approach that is increasing the percentage of BSN-prepared nurses on the Suncoast (Sarasota-Manatee-Charlotte-Desoto counties) and successful strategies others can use to help achieve the Institute of Medicine’s recommendations that 80 percent of the nursing workforce have a bachelor’s degree or higher by 2020. Continuing Education: 1.0 nursing contact hours will be awarded for completion of this activity. Sarasota Memorial Health Care System is accredited as a provider of continuing nursing education by the American Nurses Credentialing Center’s Commission on Accreditation.